It’s difficult to predict how trade tensions between the United States and China will ebb and flow, although it appears more near-term turmoil is coming. Between the two powerhouse economies but inexorably linked to the United States, Canada needs to understand China better before considering a deeper economic relationship. It can do so by leaning on its neighbour to the south with hopes of benefitting in the long run. The Trump administration has targeted China for its untoward conduct in international trade, theft of intellectual property, and forced transfers of technology. Bloomberg reported that the United States is preparing to announce tariffs on all remaining Chinese imports in December if talks fail to ease tensions. “I do think that ‘cold war’ is an adequate term that correctly characterizes the relationship between the United States and China,” said Matt Gertken, vice president of geopolitical strategy at Montreal-based BCA Research, in an interview. “What I think that means is that we’re in for a very long period … that will be defining the 21st century in which U.S.-Chinese competition is central to global affairs. “That’s a result of the fact that the U.S. is playing catch-up in retaliating for years of Chinese practices and strategic rivalry,” Gertken said. White House National Economic Council Director Larry Kudlow said U.S. President Donald Trump wants fair trade with China. “The President wants a level playing field, reciprocity, zero barriers, zero subsidies,” he said in a speech to the Economic Club of Washington on Oct. 4. The “concessions” that the United States is demanding from China require a “pace and depth of economic reform that the regime has not been willing to do so far,” Gertken said. However, slowing down technology acquisitions, curtailing state-owned enterprises, and letting the currency float freely would fundamentally alter the control that the Chinese Communist Party (CCP) has over the country. Chinese leader Xi Jinping has consolidated his power in China and will not want to be seen as caving, Gertken said, but Trump and Vice President Mike Pence have laid bare the Chinese threat for the American public. “The Democratic Party will be equally keen to demonstrate that it is tough on China as well,” Gertken said. Thus, the dynamic between the United States and China has fundamentally changed for the worse, and with justification, from the Trump administration’s standpoint. For now, Canada is holding off on free trade talks with China. Canada’s ambassador to China, John McCallum, emphasized different issues from those that trouble the United States. He told CBC that China must show flexibility on wages, gender equity, and human rights—demands the CCP previously dismissed. But he maintains that China, the world’s second-largest economy, must be a part of Canada’s trade strategy on account of its sheer size. Finance Minister Bill Morneau and Trade Diversification Minister Jim Carr are to meet with Chinese political and business leaders later in November. Former Canadian prime minister Stephen Harper said in a recent interview with the Toronto Sun that his government did not pursue a trade agreement with China despite concluding negotiations with 51 other countries. “I certainly don’t feel the present government is in a position to negotiate a good trade agreement with China,” he said about the Liberals. Harper said working through the United States to open up the Chinese market is the only way forward for Canada, as Canada can’t go it alone in trying to rectify not having fair two-way trade with China. “The American administration put in that [United States-Mexico-Canada] agreement several things that provide incentives for the governments of Canada and Mexico to work with the government of the United States in opening up the Chinese market,” Harper said. Article 32.10 in the USMCA, which makes Canada and Mexico think twice about free trade with China, is the “poison pill” provision, as described by U.S. Commerce Secretary Wilbur Ross. It is a clause the United States could insert into trade agreements with the EU and Japan to further pressure and isolate China. Trade adviser Eric Miller, president of the Rideau Potomac Strategy Group, said the Trudeau government is trying to figure out what room it has to manoeuvre given this clause. “It’s also spurring … a much-needed discussion and debate about if you are going to do an agreement with China, what should that look like anyway, and is it even a good idea to begin with,” Miller said in an interview. Miller’s argument is that Canada has much to understand about China in order to develop the right strategy, whereas the United States is already clear on its approach. It is trying to form a unified trade front with its democratic allies against China. 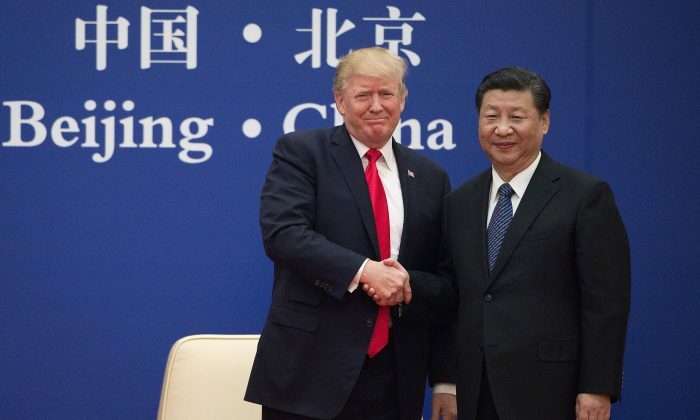 “I think we could expect that President Trump will be quick to criticize Canada if he thought that its relations with China were undermining his efforts to put pressure on China,” said Gertken. China is seeing the international environment changing, as countries are becoming more skeptical toward the communist regime with respect to trade and foreign investment. Depending on the escalation of the U.S.-China trade tensions, the Chinese economy could be facing challenges it hasn’t seen before. “They’re [China is] struggling to figure out what does this mean and where does this go,” Miller said. Chinese policy-makers face a difficult balancing act to maintain economic growth that appeases the population while not completely abandoning the reform agenda in favour of more government spending and borrowing. BCA Research has a structurally bearish view of the U.S.-China relationship. As it sees the walls closing in, China would like nothing more than to have preferential access to Canada, one of the United States’ closest allies. The Bank of Canada said deteriorating relations between the United States and China is the biggest downside risk for the Canadian economy; however, should Trump strike a “great deal” with China, as he told Fox News he expects he will do, Canada would benefit. On net, the BoC views the current standoff as a slight negative for the Canadian economy. Miller said that Canada, as a mid-sized open economy with lots of natural resources and significant foreign investment needs, must figure out what a relationship with China should look like. “And how does it reconcile with Canadian interests and Canadian values?” he added.